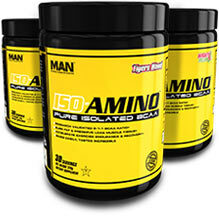 ISO-Amino by MAN at Bodybuilding.com - Best Prices on ISO-Amino! 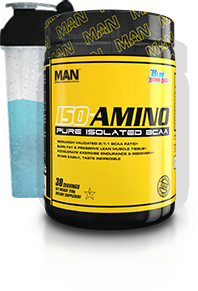 ISO-AMINO packs 5 grams of pure isolated BCAAs per serving in a scientifically proven 2:1:1 ratio. 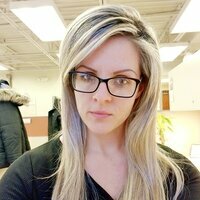 No fluff, no fillers and no added colors or dyes. BCAAs are everything you need to rebuild, repair and trigger lean muscle growth.† ISO-AMINO can be taken throughout the day and is especially useful intra-workout to speed recovery. We take flavor & mixability very seriously, this is where ISO-AMINO stands as the clear leader. The ultra-unique flavors and easy to mix powder set the standard for high quality BCAAs. 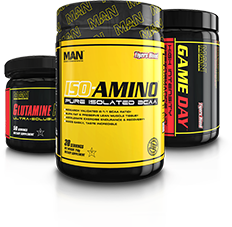 Fuel your athletic performance with ISO-AMINO. Download our stacking guide to learn how to combine MAN Sports products, optimize your workouts and achieve your goals! Pure BCAAs are everything you need to rebuild, repair and trigger lean muscle growth. ISO-Amino is a throwback to the old school BCAAs that are just that, pure isolated BCAAs. No added marketing fluff, prop blends or underdosed "everything & the kitchen-sink" formulas that only cushion the manufacturers wallet. 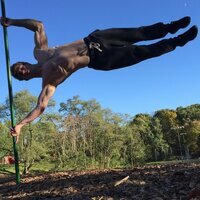 So why the 2:1:1 ratio of BCAAs? Simple, "if it's not broke, don't fix it." Scientists from Baylor University gave college-age men either a leucine supplement, a BCAA supplement or a placebo before and after a leg workout. They discovered that while leucine increased muscle protein synthesis after the workout better than the placebo did, the BCAAs increased protein synthesis even better than leucine and the placebo. That's a big reason to stick to a 2:1:1 ratio when it comes to BCAA supplements. It has nothing to do with science or efficacy - but it's important to enjoy what you spend your hard earned money on. We take flavor & mixability very seriously. This is where ISO-AMINO stands as the clear leader. MAN Sports has made monumental advances in flavor systems to provide extremely unique, one-of-a-kind flavors. Try any of our unique flavors from Tigers Blood (strawberry, watermelon, & a splash of coconut) to Mighty Melon and you'll be blown away. These are the kind of flavors you'll WANT to sip all day! Every batch made in limited quantities, every bottle a testament to the work and science that has gone into each handcrafted formula. Formed by the perfect blending of science and application. There is beauty in the process of manufacturing every micro-batch, that has been long forgotten, we refuse to hand over the manufacturing to a mass-production facility. All of this is made possible thanks to highly qualified personnel who care about your finished product and by heavily investing in the most advanced lab equipment available today. As a dietary supplement, mix one serving (one level scoop) of ISO-AMINO with 8oz of water. Stir or shake and consume during exercise on training days or throughout the day on both training and non-training days. Stack ISO-AMINO with Game Day, Glutamine Peptides and/or CLA Powder for enhanced results. 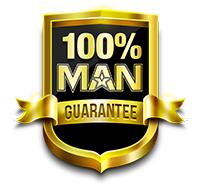 Every MAN Sports™ Product is guaranteed for maximum purity and potency and is backed with a 100% money back guarantee. Manufactured with pride in the USA. MAN Sports' research and development team has comprised detailed stacks, pairing products together that provide optimal results to help you reach your fitness goals. Download the complete stacking guide today. It takes longer. It takes more labor. It's tedious and precise. Making micro-batches is not easy, but its the only way we know how to provide the premium quality in every bottle we demand. We take pride in our work.. I love this product. Provides a great boost while pushing through a heavy lifting session (especially legs). I also enjoy sipping on it throughout the day when I'm looking from something a little sweet. The sour batch is a pretty good flavor, but so far my favorite has been the banana whimps. I have dorks on the way. Can't wait to try it out!!! 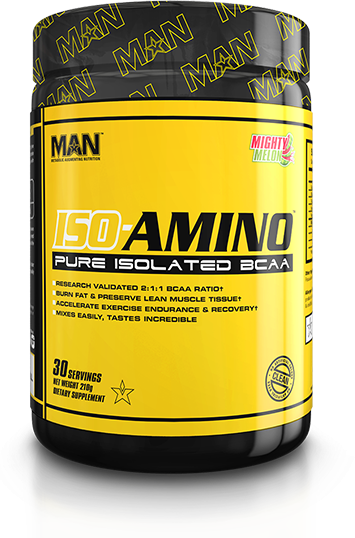 ISO-Amino is one of the best aminos on the market, and it is my go to. The flavors are on point. It is easy on the stomach. And, it is a clean product. No dyes. No fillers. No unnecessary additions. Great for leg days, and really easy for intra workout. I will continue to use this product. I used to be a fan of Scivation but after trying almost all of their flavors I was on the search for something new! I came across MAN Sports and immediately was drawn to the flavor selections of the ISO-Aminos. I use ISO-Amino before I do my fasted cardio first thing in the morning and also intra-workout for my evening training session. These mix really well - no grit left over at the bottom of my shaker. I really like that they are dye-free as well! 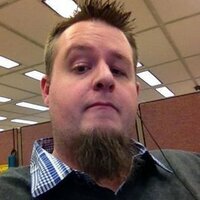 In regards to flavors - I was not really a fan of the "candy" type flavors ; they're okay in my opinion. I very much preferred the apple, grape, watermelon and pineapple flavors hands down! Those are SO delicious! 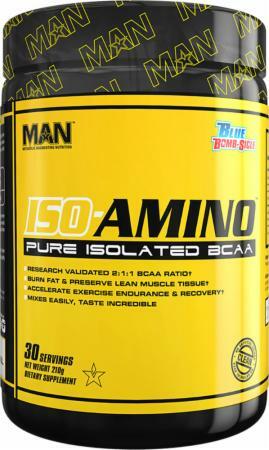 I came across ISO-Amino because the price at $19.98 for 30 servings was to good. My main source of Amino product is Amino-X by BSN, which is in my opinion one of the best products on the market. For this product though, the taste on the Grape Bubble Gum wasn't as enjoyable. It leaves a weird taste and hate that because I love my grape flavor. I prefer the Sour Batch flavor more. It will give you that strong sour taste. You'll be making that face for sure after drinking that flavor. Overall though the product does the job when it comes down to recovery and performance. If you're interested in it then I would say give it a try, maybe the other flavors they provide are better tasting then the ones I had. The sour batch flavor is awesome. I've always been a big fan of sour patch candies and this taste just like it. Tigers Blood tastes like coconut with a small splash of bitter fruit. It tastes best with 1 scoop + 20 oz of ICE COLD (like 8-10 ice cubes) water. When the water begins to become warm, the flavor becomes more bitter. If you don't like coconut or a bitter taste, you wont like this. I enjoyed it though when ice cold. Recently ordered the newer 90 serving MAN ISO-Amino in the flavor Dorks. I find it really cool that each is micro batched instead of mass produced which is pretty much a rarity these days. And the naming convention for each flavor is anything but conventional. Since Xtend is getting more popular and expensive in price, I decided to look for something with a similar nutritional profile to suit my needs. I typically take BCAA’s intra-workout. Upon opening, there is a nice scent from the powder that reminds me of grape candy (Nerds). Used one scoop as per the instructions with the recommended amount of water. One thing that I did notice about this product is that it does not mix very well off the bat. I have been using Blender Bottles for years and you really have to shake this ISO-Amino pretty hard to get the clumps out from the bottom. Once it is mixed, there is no grit whatsoever and goes down smooth. In terms of taste, it is nicely palatable with no bitter or harsh aftertastes. To me it reminds me of a grape-lemonade with just the right amount of sourness. For myself, I add more water to adjust the taste to my liking, anywhere from 12 – 16 oz of water. Dorks is a good flavor, but I feel that the reviews on here are overhyped for this one particular flavor as it is ranked the highest. Hopefully they release additional flavors in the 90 serving container as I am interested in trying those. Needless to say, I would recommend and purchase again. 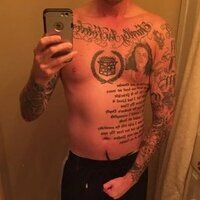 I've been using this product in combination with my workouts for 9 months. 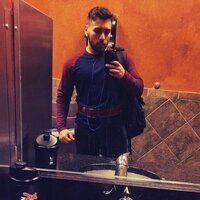 It has really helped me with endurance while working out resulting in shedding 7lbs! ISO-Amino is probably my favorite BCAA supplement that I have taken so far. This product utilizes the proven 2:1:1 ratio for optimal absorption and I definitely feel a quicker, stronger recovery from even my toughest workouts while I'm consuming this product. Flavors are very unique and are strong enough to be mixed with a large volume of water to drink throughout the day. Great taste, easy mixing and like that it does not have food color. Silicon Dioxide, Natural & Artificial Flavors, Citric Acid, Sucralose, Acesulfame Potassium (Ace-K). Allergen Warning: This product was manufactured on equipment that processes products that may contain milk, egg, soy, tree nuts, peanuts, wheat, fish, crustaceans & shellfish. 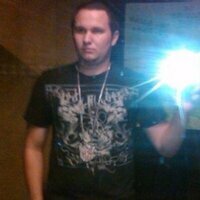 As a dietary supplement, mix one serving (one level scoop) of ISO-AMINO per 8oz of water. Stir or shake and consume during exercise on training days, or throughout the day both training and non-training days. Stack ISO-AMINO with Game Day, Glutamine Peptides and/or CLA Powder for enhanced results.